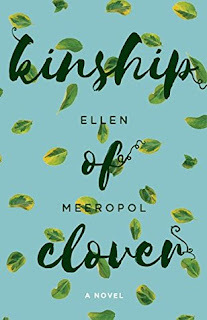 This is a guest post from Ellen Meeropol, author of Kinship of Clover, and a Poetic Book Tours stop. All roads lead to the kitchen, but when you’re writing a novel you may have no idea where the story will take you and your taste buds. You hope that the path will take you someplace new, someplace delicious. That’s what happened to me with Kinship of Clover. I started with Jeremy, a college student who studies botany because he loves plants. In particular, he loves drawing plants. Jeremy grew up in an oddball cult; his family grew tea and most of their food in their backyard and greenhouse. So it didn’t surprise me when Jeremy became obsessed with disappearing plant species. What was surprising was that his imagination went into overdrive and he saw and felt endangered plants growing into his body. Whoa. This was way beyond my knowledge base. I started wondering – and reading – about what a contemporary college student might believe about plants, especially growing food. That research led me to the concept of permaculture. I learned that permaculture is a system of creating sustainable, edible landscapes, a way of growing food that is beyond “natural” or “organic.” It’s based on observation of the patterns and relationships found in nature. 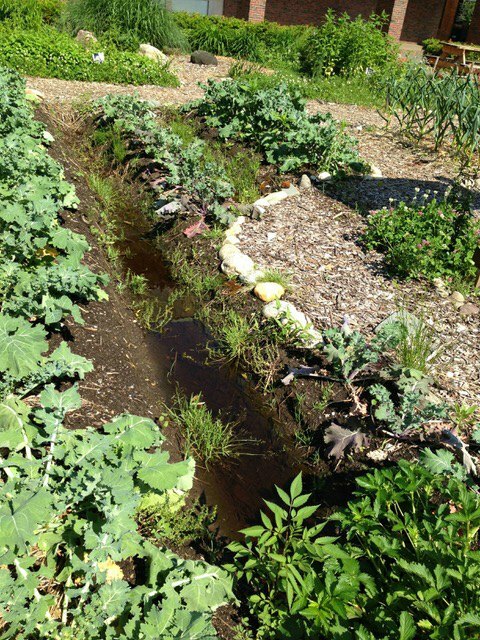 It focuses on soil life, water conservation, and cycling of nutrients. 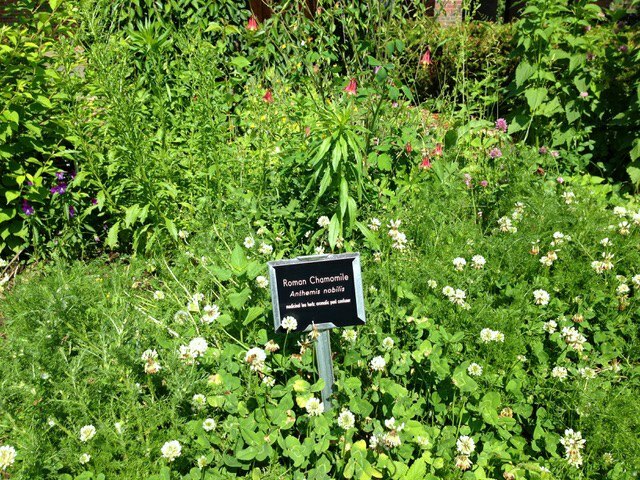 To protect biodiversity and genetic integrity, permaculture gardens use only non-hybrid and heirloom seeds. The amazing thing is that over time, these gardens become more productive, because the soil and plant resources are not depleted. I was fascinated by these ideas, and so was Jeremy. But in order to weave these concepts into fiction, in order to put Jeremy and permaculture together in my novel, I had to experience this type of garden for myself. I had to see it, feel it, smell it, and even taste it. Fiction depends on the right sensory details. Luckily, the University of Massachusetts at Amherst is close by and it is one of the important settings for this novel. Their permaculture project has received global recognition, including being honored by President Obama at the White House in 2012. 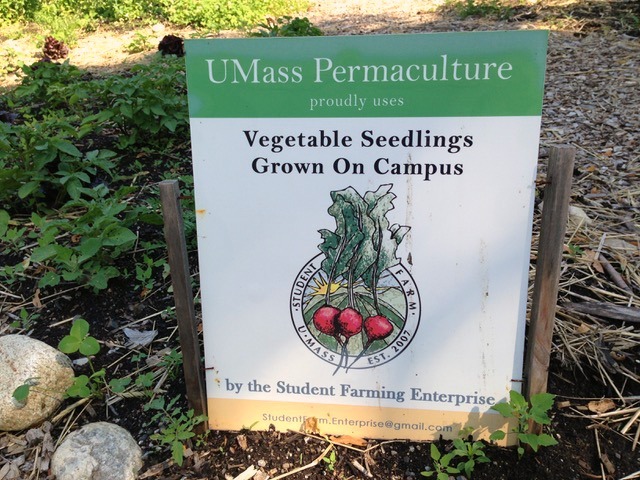 A student manager of their Permaculture Garden answered my initial email and in early June, 2013, I visited. It was a hot day. I wandered in the garden, took photos, listened to my student guide and the buzz of insects. As I asked questions, I tried to crawl into Jeremy’s skin, to see through his eyes. I watched bees land on chamomile blossoms and smelled the rich earth in narrow trenches. As we walked and talked, as I learned about nitrogen fixers and dynamic accumulators, Jeremy’s connection to the garden on his college campus sprouted, developed and grew. Kitchens came to play small but critical roles in the plot as I wrote and revised Kinship of Clover. Good things happen in kitchens in this book, and one very bad thing as well. Throughout the novel, preparing and sharing food connects the characters to each other and offers them comfort, much as it does for us as readers and writers. So it might make sense to say that the road to this novel leads to the kitchen by wandering through lush gardens of veggies and teas and herbs, and by asking how we can best nurture ourselves and save our planet. teaser: He was nine when the vines first wrapped themselves around him and burrowed into his skin. Now a college botany major, Jeremy is desperately looking for a way to listen to the plants and stave off their extinction. But when the grip of the vines becomes too intense and Health Services starts asking questions, he flees to Brooklyn, where fate puts him face to face with a group of climate-justice activists who assure him they have a plan to save the planet, and his plants. As the group readies itself to make a big Earth Day splash, Jeremy soon realizes these eco-terrorists’ devotion to activism might have him―and those closest to him―tangled up in more trouble than he was prepared to face. With the help of a determined, differently abled flame from his childhood, Zoe; her deteriorating, once–rabble-rousing grandmother; and some shocking and illuminating revelations from the past, Jeremy must weigh completing his mission to save the plants against protecting the ones he loves, and confront the most critical question of all: how do you stay true to the people you care about while trying to change the world? about the author: Ellen Meeropol is fascinated by characters on the fault lines of political upheaval. Previous work includes a dramatic script telling the story of the Rosenberg Fund for Children which has been produced in four U.S cities, most recently in Boston. Elli is the wife of Robert Meeropol, youngest son of Ethel and Julius Rosenberg. Elli is a former nurse and independent bookstore event coordinator and the author of two previous novels, House Arrest and On Hurricane Island. She is a founding member of Straw Dog Writers Guild. Short fiction and essays have appeared in Bridges, DoveTales, Pedestal, Rumpus, Portland Magazine, and the Writer’s Chronicle. April 7: All Roads Lead to the Kitchen (Guest Post) - YOU ARE HERE!